Creating marketing charts with free templates and examples. Marketing charts has never been easier. Marketing charts and diagrams are extensively used for process diagramming, benchmarking, simulation and improvement, path routing, market and resource or "what if" analyses, deployment charts, targets, sales pyramids, activity-based costing, and task management. Although the rise of big data provides Modern Marketers with an unprecedented level of insights, it is easy to get buried by the data. These headache problems are solved with the emergence of marketing charts and diagrams. 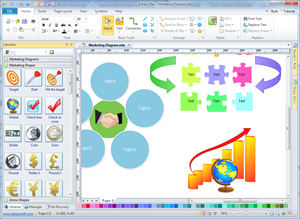 Edraw allows you to draw a marketing chart freely through its pre-defined template. 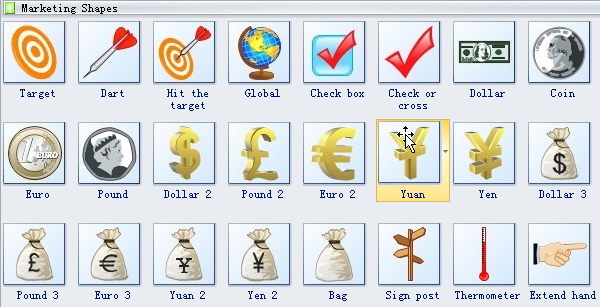 With the help of abundant pre-drawn symbols and shapes, you don't need much drawing skill, yet to produce a professional-looking and beautiful chart and present your business process. All the beauty diagrams you have designed can be easily exported to PDF or other graphic formats, and also can be printed in a strict correspondence with the screen picture. 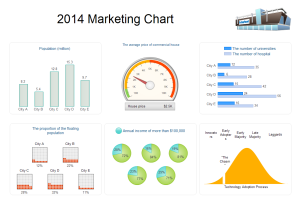 Check a marketing chart template to verify its usefulness and then deploy it to make impressive charts.